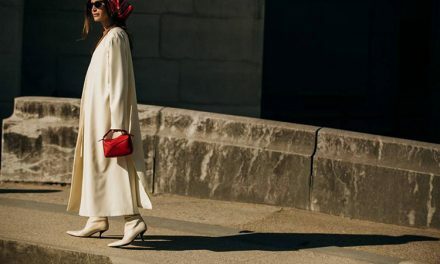 As part of our weekly Back to Basics series, we are shining a spotlight on great wardrobe staples that are made to last. Because timeless basics are the most sustainable pieces you can buy. The humble blazer is not just one part of your suit. It’s an exciting stand alone piece that can transform any outfit into something show stopping. Whatever your body shape, you can find something perfect to flatter or accentuate. For example, ladies with smaller chests can wear double breasted blazers, or blazers with lapel details. Those with bigger busts look great in single breasted jackets. 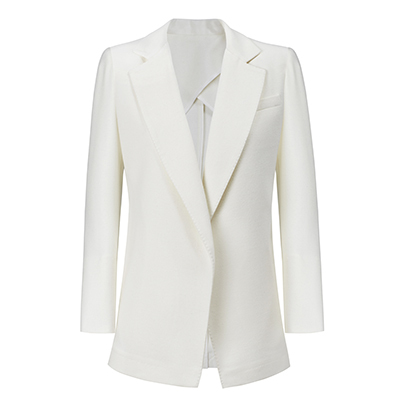 We love longline blazers as they skim past your body in a way that flatters and creates length. Experiment with length; cropped blazers often look good over long slip dresses or tailored trousers. While a slightly longer cut adds a bit of style and drama to a simple outfit of jeans and a shirt. While we love the timeless qualities of a black or navy blazer, why not experiment with colour and print? This winter, velvets and corduroys are still very wearable. Autumnal hues including browns, burgundies, burnt orange and emerald green are all winners too. 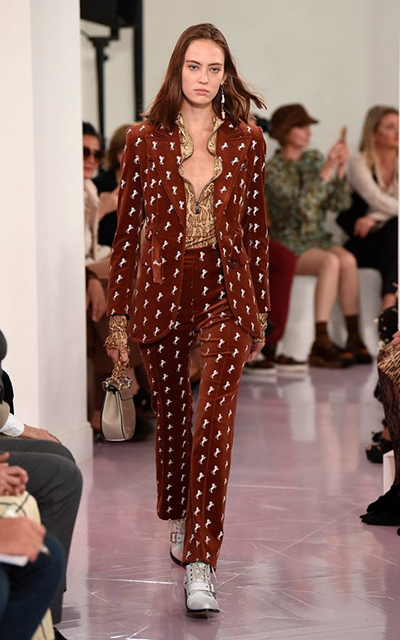 Pair with a matching trouser, suits are still very cool. If your blazer is long enough, try a belt to add a little unique touch. Have it Eco Dry cleaned at the beginning and the end of the season. Use a soft bristled brush to remove dirt from wool blazers. A clothing refresher spray will breath new life into your blazer between dry cleaning appointments. When not wearing it, store in a hanging bag on a wooden hanger to ensure the shoulders don’t lose their shape. Don’t fold your blazer, the fabric needs space to breath so hang it in your wardrobe, always on a wooden hanger. If the lining becomes tired or damaged, take it to be relined to breathe some new life into it. 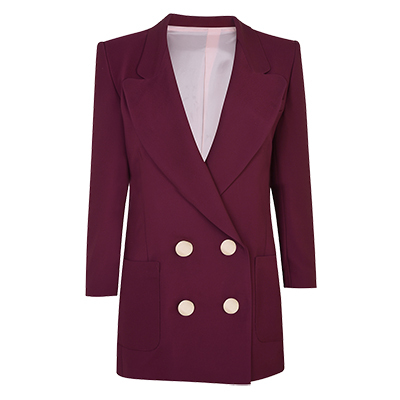 To make your blazer more on trend, replace the buttons with something a little more jazzy. 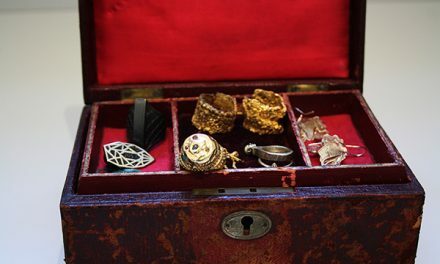 Sourcing chunky vintage gold buttons is always fun, they don’t even have to match. Invest in a small steamer, it’s a quick and easy way to make sure your blazer looks it’s best. 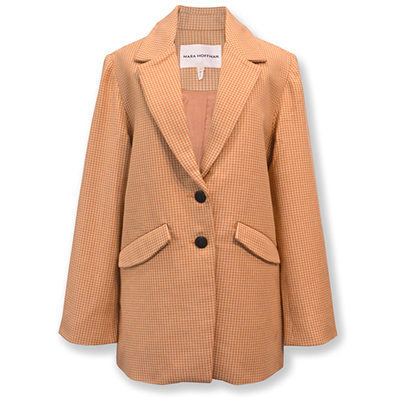 Crafted to order in London from ‘end of roll’ fabric, this blazer is certainly an investment piece. Cut slightly loose and long, with cropped sleeves, we love this modern twist on a timeless classic. This single breasted, longline blazer has the perfect relaxed fit. Pair with it’s matching trousers and black patent stilettos for a very elegant evening look. Or a simple cotton shirt and sneakers for day. Tailored using traditional Neapolitan techniques in Italy, this impeccably cut blazer is an investment piece. 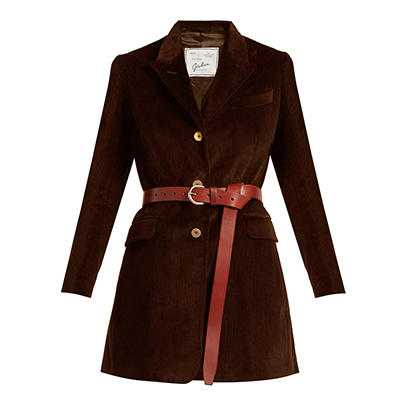 The heavy duty corduroy and leather belt make it a perfect for Autumn. We love the unexpected colour of this organic cotton jacket from Mara Hoffman. It has an oversize fit with shoulder pads making it a great option to throw over a sweater and jeans combo. 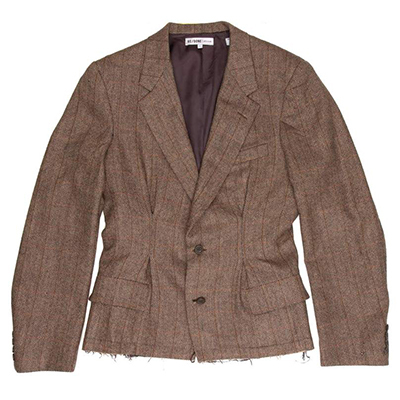 For something a little different, this blazer has been crafted from pieces of vintage wool blazers. It has a boxy 40’s style cut and is nipped in at the waist to accentuate your curves. They’re in limited supply so don’t wait. Disclaimer: The people and models in the images featured are not associated with The Vendeur and do not endorse it or the products shown. This post may contain affiliate links. Prices correct at time of publishing.